The ultimate in contemporary drywipe whiteboard presentations. 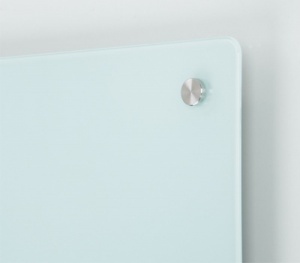 The clean lines of this magnetic glass drywipe board is enhanced by the chrome mounts which float the board away from the wall. Available in a choice of 10 sizes from 500mm square up to 2.4 metres wide. The surface cleans easily with no ghosting. For use with high power neodinium magnets. Optional matching glass pen tray available. All fixings included.